Armello’s changed a bit since its release last year. Like so many other multiplayer games on Steam, the digital board game has added item chests and keys, allowing players to obtain cosmetic items (new dice, in this case) either through a coin toss at the end of a match or by buying them via the Steam community market at varying prices. It’s also added a bevy of new cards that add a few new wrinkles to the minute-to-minute action, such as poison strikes and the ability to reflect damage in battle. But that’s just the free updates developer League of Geeks have released over the past year. With the one-year anniversary of Armello’s release coming up, the game is getting its first paid add-on in the Usurpers Pack, which adds four new characters and rings. I’ve spent the past week giving them a spin, and it’s definitely a worthy add-on. 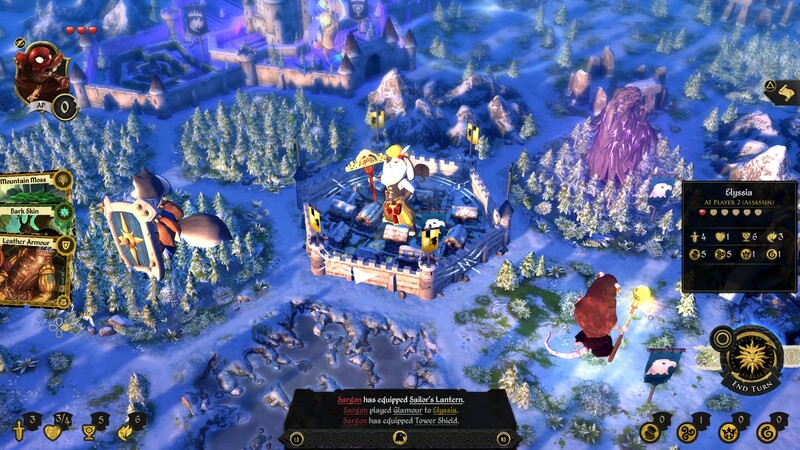 If you haven’t heard of Armello before, it’s a digital board game set in a fantasy world inhabited by anthropomorphic animals. Four players compete to take the throne by any means necessary. Whether that’s through subterfuge and trickery, winning the hearts and minds of the populace, or outright killing your opponents to slow them down is up to you. You can read our review of the base game for more information. The four characters in the Usurpers Pack are Magna, Sargon, Elyssia, and Ghor. Magna’s a large wolf carrying an equally large shield who can naturally reflect most damage received in battle. Sargon is a rat who’s able to see the cards on the top of each deck before drawing them. Elyssia is a rabbit that can fortify settlements when she ends her turn on one and isn’t affected by the movement penalties fortification imposes. And Ghor is a bear who, when residing in a forested tile, can cut the amount of magic points necessary to cast spells, the effect stacking with each adjacent forest. Of the four new characters, Magna and Elyssia tend to be my preferred choices since they’re naturally suited to my playstyle. Magna’s high hit-points and combat prowess make her ideal for taking a more aggressive approach, just as Elyssia’s ability to fortify settlements allows her to maintain control of settlements and make money quickly. Couple that with her high wit stat, and that cash allows her to play item and trickery cards with ease while keeping a large stock for just about any occasion. Sargon’s ability preview cards before drawing them is by far one of the strongest in the entire game given how much of a difference knowing what cards you’ll get can make, but his average stats across the board make him a tough character to use. I haven’t quite been able to get the hang of him. In the right hands, he could definitely be a force to be reckoned with. I haven’t used Ghor much on virtue of not being one for playing magic-focused builds in Armello, but he feels a lot easier to use than Sana or Brun thanks to how plentiful forest tiles are. Being able to cut the magic cost down to zero for most spells makes him a very dangerous enemy with the right cards. If you haven’t touched Armello in a while, the Usurpers Pack is a good reason to jump back in. The DLC launches on August 30, alongside the Xbox One version, and will retail for $9.99.